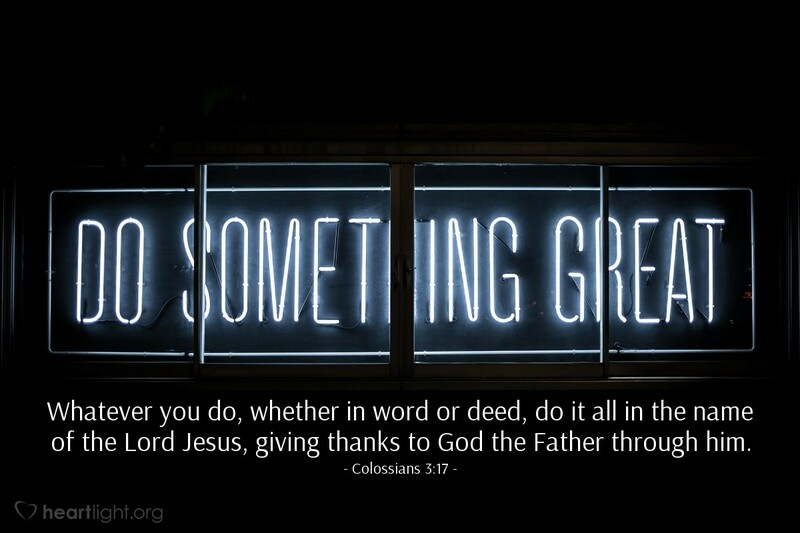 Whatever you do, whether in word or deed, do it all in the name of the Lord Jesus, giving thanks to God the Father through him. Everything! All! No matter what we say, no matter what we do, it is to be offered as a gift of thanks to God with Jesus' name, power, and honor attached! This makes all of life our worship and thanksgiving to God. There's no such thing as going to worship, if we live, if we talk, if we act it's worship and should always involve thanksgiving. So how has your worship been lately? Almighty and Most Holy God, I want all of my life to be lived out to your glory, a living testament of thanks to you for the grace you have given me in Jesus. While I do not always do this as well as I would like, I lovingly offer you my words, my actions, my heart and my mind to bring you glory by doing your will. Please, use your Spirit to remove the areas of self-deception from my life so that weakness and hypocrisy will not rob my discipleship of its intended worship of your majesty. In the name of Jesus, my gracious Lord, I pray. Amen.